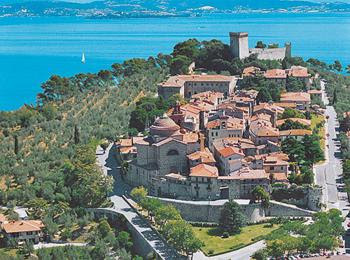 The town rises on a calcareous elevation that in prehistoric times was the fourth island of Trasimeno lake. Many findings testify that the center was once populated by Etruscans and Romans. The currently inhabited portion of town preserves the medieval wall ring and the ancient castle. This is connected to the 16th century Commune palace through a passage illuminated through loopholes. The commune palace was built upon the ruins of another building belonging to Ascanio della Corgna, one of the commanders of the Lepanto battle in 1571. You will find frescoes from the second half of the 16th century in the high rooms of the palace. The authors of the frescoes are Salvio Savini and Giovanni Pandolfi, who followed the Renaissance roman style. The Maddalena church, a Greek cross plan building, you will find delightful stuccoes by Piervittori. Castiglione del Lago is famous for the "Let's Color the Sky" event that takes place here every two years. It is a gathering of hot hair balloon and kite enthusiasts. Also to see is the Rock of Leone, which was completed in 1247. It has a pentagonal shape and four corner towers with a central keep. This is one of the best examples of military Umbrian middle age buildings. Its location is on a calcareous rock from where one dominates the entire view of the Trasimeno lake. The Corgna palace is another must-see. It was planned to insert rest on the so-called houses of Baglioni and on part of the preexisting wall ring. The palace and the rock are nearby and connected through the above mentioned passage, which is really suggestive and should be experienced. The whole arrangement has a typical medieval aspect. Inside you will find an important and large painting work of art by Pomarancio, which was the art name of Circignani. The paintings were completed in 1574 and can be found in the Room titled "Gest di Ascanio della Corgna".